A casual ensemble for you today that's less a composed look + more an eclectic assortment of goodies that are yours for the taking, courtesy of various hunts being hosted around the grid. And since I always go on about how hunts are prime pickings for top-quality home decor gifties, I wanted to show you some lovely things from the Easter egg hunt currently happening at The Nest. 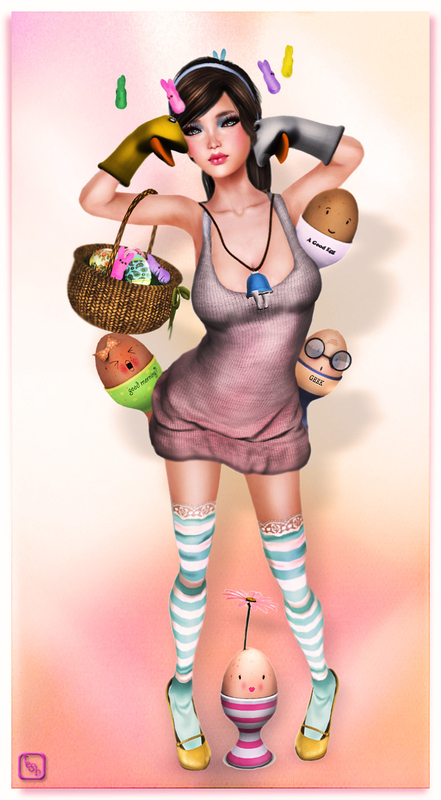 -- What I enjoyed most about this hunt was how "Easter"-y it felt: it's an bona fide egg hunt in every sense, since there's literally a bounty of eggs sprinkled generously around the SIM. With so many eggs in plain sight, it's an easy one even for the rookie hunter. As a fair warning, the SIM has been swarmed, so you may want to go as low-lag as possible. How cute would these things look on anyone's table or dresser? I also had to mention 1 of my fave recent gifties: this utterly charming, "Alice legs" charm necklace that's free by Sheep Door (it's shown in both photos here). It's yours for the taking on the RMK Gothic SIM's Bunny Hunt that's already been mentioned a few times here on this blog; however, since it took me a hot minute to figure this one out, I included more in-depth instructions in the Styling Credits below that should pretty much cover it. -- Basically, you're hunting for scripted, twirling bunnies moving across the SIM, instead of a single hunt object in participating stores (if you catch the bunny for Sheep Door, the necklace comes included along with an entire outfit inside). Springtime hunting love + fashionista kisses to all! *NOTE on the Bunny Hunt: You can read more about this hunt on the official blog here (click the "English" translate button on top right), but basically, you need to go to the RMK Gothic SIM here. Walk thru the 1st screen until you get to the Humpty Wall; enter thru the low door (fair warning: you'll fall quite a ways down into the Alice-decorated part of the SIM). Once you land, wander around to look for small bunnies set randomly around the SIM; follow them (for quite a minute) until they drop tickets (which you'll need to quickly click + "Buy" + then also "Take" in order to redeem them. DON'T FORGET TO "TAKE" THE TICKETS AFTER YOU BUY THEM). Collect as many tickets as you can, then redeem each gift by "Wearing" the ticket of a store + clicking the open storybook at each store's redemption SLurls listed on the blog here. It's not as complicated as it seems! Basically, you are hunting scripted rabbits, clicking on them once they drop tickets, and then using each rabbit's tickets to redeem prizes. It's a different/fun take on the traditional hunt!